Unveil the mysteries of primeval legends, encounter ancient creatures from a time before time, and prepare to enter a preternatural world where nothing is permanent and everything is alive and vibrant. 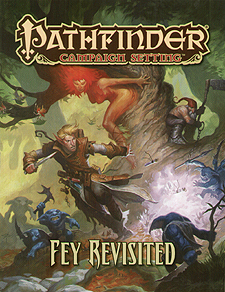 Now the Pathfinder Roleplaying game explores 10 of the Golarion's most iconic and well-loved fey creatures in Pathfinder Campaign Setting: Fey Revisited! With Fey Revisited, you can immerse your game in the rich lore of legendary beings such as vigilant tree-bounded dryads, fanciful goat-legged satyrs, and blindingly beautiful nymphs, or release lurking evils like sadistic redcaps and diverse hordes of maniacal gremlins. Each entry includes how these embodiments of nature might guard or corrupt the world, details on the unique tokens they bestow upon favoured mortals, and a ready-to-use threat or ally of each fey race. Leprechauns, folkloric pranksters rumoured to hide great riches available to those who find their stash.